Science is one of the key interests in the development of Basic, and at the same time it is the greatest international force in existence. Through science, which has given us the radio and television, the talking-picture, and the telephone, it is possible for a knowledge of Basic to become general in a very short time; and science itself might go forward with greatly increased power if Basic was used for papers and meetings. Earlier in this book (See pp. 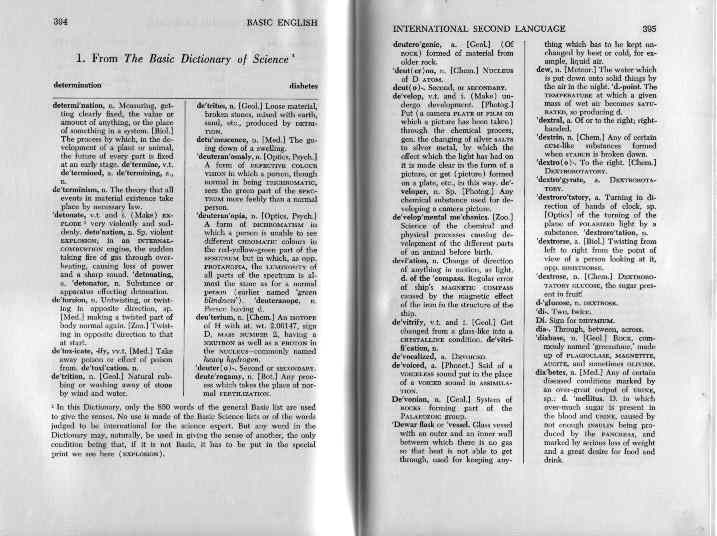 75-81 and 236) something has been said of the value of Basic in connection with science, and of the further word-lists which have been designed for covering this field. Some examples of science-writing in Basic have been given, and now, in this division are grouped five more, all but the last taken from Basic printed books. The first of these is from The Basic Dictionary of Science, which is designed to be used by persons whose knowledge of English is limited to Basic, and so is itself limited to Basic. The second and third, the purpose of which is simply to give the Basic learner interesting reading-material, in the same way do not make use of any of the science lists. The fourth, though equally interesting to the general reader, may be looked on as more for those taking up science, and for this reason words from the General Science List have been freely used in it. In the last, we see in operation the full apparatus of Basic for the man of science. Notes at the front of the Examples will make clearer the different ways of working with material at different levels. The reader of this book, however, will not for the most part be an expert in science, and it is not desired to make a knowledge of the Basic Science Lists a condition of his getting any pleasure from these examples. So the senses of all the special science words used in Example 4, and of anything which might be a cause of trouble in Example 5, are given there. Our only desire in giving examples using the lists is to let him see the system at work. For the same reason, we give here the complete General Science List of 100 words, and two of the special science lists of 50, that for Physics and Chemistry and that for Biology. Anyone desiring more light may get it from Basic for Science, where further lists are given, with examples of the use of all of them in material for the expert. Such high-level examples have not been put in here, because the material needing the special lists is generally not of a sort to give pleasure to the general reader as we may see from Example 5. 5 . Basic English and the British Standards Institution.